A fugitive of the U.S. Department of Justice and former governor from the Mexican border state of Tamaulipas came out to a public polling booth in Mexico to vote for the members of his party. Former Governor Eugenio Hernandez Flores went to a local polling location on Sunday in the ritzy Del Valle neighborhood in the Tamaulipas capital of Ciudad Victoria to cast his ballot. The polling place was full of reporters because it is where the current governor and other local politicians were set to go cast their ballot. After he went into the voting location, Hernandez posed for photos with reporters as he showed off his ballot. The fugitive governor voted for his party, the Institutional Revolutionary Party (PRI) which has a long history of working hand in hand with cartels. As Breitbart Texas previously reported, Hernandez has an existing arrest warrant out of the U.S. Southern District of Texas from a federal indictment charging him with money laundering. In a similar fashion, Hernandez’s predecessor, former Governor Tomas Yarrington is also wanted fugitive. He is wanted not only on money laundering charges, but also on drug conspiracy charges for his role as a surrogate of the Gulf Cartel, Los Zetas Cartel and the Beltran Leyva Cartel. Since then the U.S. Drug Enforcement Administration (DEA), Homeland Security Investigations (ICE- HSI) and the FBI have openly labeled both former governors as wanted fugitives. 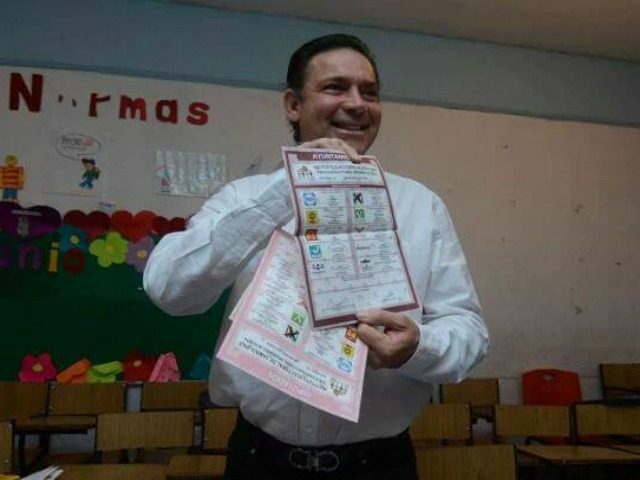 The candidate that Hernandez voted for is Baltazar Hinojosa, a former mayor from the border city of Matamoros, who has himself been linked to acts of corruption. As Breitbart Texas previously reported, Hinojosa is named as an individual who was present at an event when cartel members gave money to PRI officials to fund the campaign of other politicians. Hinojosa has also been linked to an ongoing U.S. Treasury investigation into shell companies used to launder funds. Various leaders from the U.S. House of Representatives have called for Mexico to extradite Hernandez. The Mexican government has thus far ignored their request.